It’s pretty rare for any show to come out of the gate swinging, to be fully formed and ready to go in the first three episodes. It’s even rarer for a show that is essentially one big corporate synergy advertisement to do this. Generally speaking what we saw with Agents of SHIELD is the norm. A show struggles to find its footing in the first half of the first season or so, and then somewhere along in there it clicks and suddenly the show works and is great and we’re all on board for the ride. In the rare case when this doesn’t happen, I always feel a little suspicious. Like with shows that immediately wow their audience, I’m always kind of worried that this means that they spent all their best material in the first few episodes and there’s nothing left to keep them going. Take for example the first seasons of Heroes and Prison Break and even Glee. These are all shows that by and large were consistently great in their first seasons, that never really needed a minute to figure out what they were doing, and that collectively pooped the bed in the second season. So when I tell you that The Flash is hilarious and wonderful and fully realized right out of the gate, I hope you understand the level of trepidation that gives me. It makes me nervous when a show knows what it’s doing so early on. And I’ve got stats to back me up. But only time will tell if Flash is going to have staying power or not. The real question I’m here to answer is a lot simpler. Should you watch it? Hell yes you should. The Flash is the kind of show that really arguably shouldn’t work but absolutely totally does. It’s based on one of the better known but not really as popular figures from the DC canon, features a rogue’s gallery that virtually no one remembers, and stars an actor whose previous major role was as a bit character on Glee. In all logic, this show really shouldn’t work. But it does. It works because, as it turns out, all of those things are assets, not hindrances. Sure, The Flash is pretty much no one’s favorite superhero (I mean, logically he’s probably someone’s, but you get what I mean), and this iteration of the Flash is even less popular than the better known Wally West version, but that’s why the story works. Just like how no one watches Arrow and gets all upset at the way the show mangles Green Arrow’s lore, no one really cares enough about The Flash to get upset if the show changes something. Which is great. See, this show has the exact opposite situation from Gotham. There the show kind of fails because the source material is so well known, and so popular, and the characters are so memorable, that the writers feel like they’re tied to the source material. They can’t deviate more than an inch without fearing legions of angry fans and angry studio executives. The Flash, meanwhile, benefits from a sort of laissez-faire approach, the CW’s specialty, where it can do pretty much whatever it wants with the original material, as long as it makes a show that feels like the original property. And so, they did. And it’s freaking great. The basic premise of the show adheres pretty well with the comics (though I have to admit that I really know very little about the Flash comics because I just never got into them). Barry Allen (Grant Gustin) is a chronically late, messy, adorable CSI tech in love with his best friend Iris (Candice Patton). 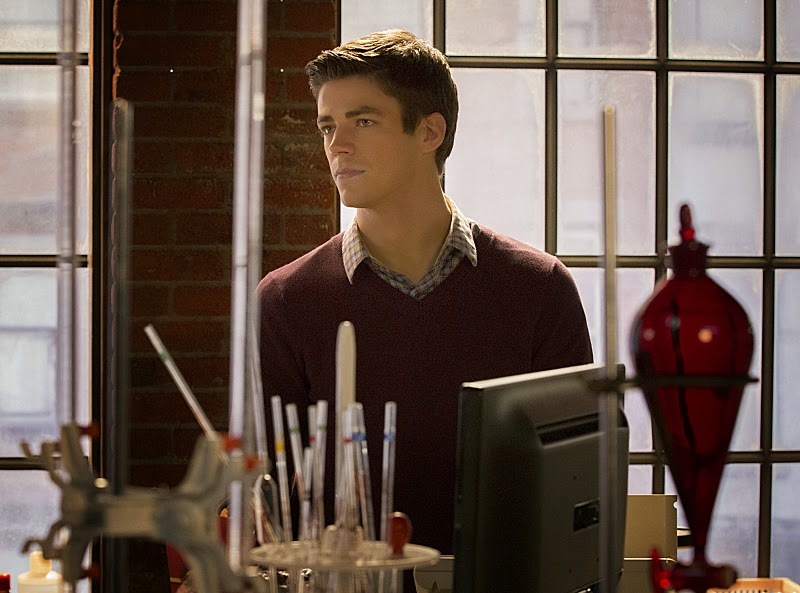 On the night that the Star Labs particle accelerator goes online, though, his life changes dramatically. A massive storm interrupts the particle accelerator, sending a wave of energy stuff through the city. Barry himself is hit by a lightening bolt. He nearly dies. But he doesn’t die, because that would be a terrible beginning for the show! Instead, he wakes up months later in a hospital bed at Star Labs to find that while he was sleeping the world changed around him. The particle accelerator explosion killed a fair number of people in the city, and created a number of metahumans, including him. Barry now has the ability to go really, really, really fast, and he has absolutely no idea what to do with this new power. Fortunately for him, the good folk of Star Labs are happy to help him test his powers. 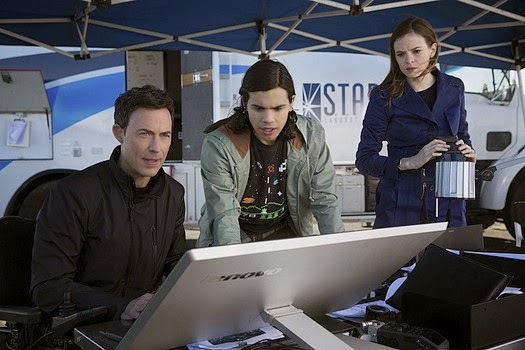 From Harrison Wells (Tom Cavanaugh), the CEO of Star Labs who was crippled in the explosion, to Caitlin Snow (Danielle Panabaker), whose fiance died that night, to Cisco Ramon (Carlos Valdes) who was right there when Caitlin’s fiance died, they’ve all got explosion-related baggage. They’re eager to find that something good came out of the blast. And that good thing turns out to be Barry, who quickly decides that he wants to use his superspeed and advanced healing to help the good people of Central City deal not only with crazed metahumans like himself, but also with run of the mill muggers and bank robberies and carjackings. Contrary to most superhero shows, Barry doesn’t really do much to keep his superhero identity secret. 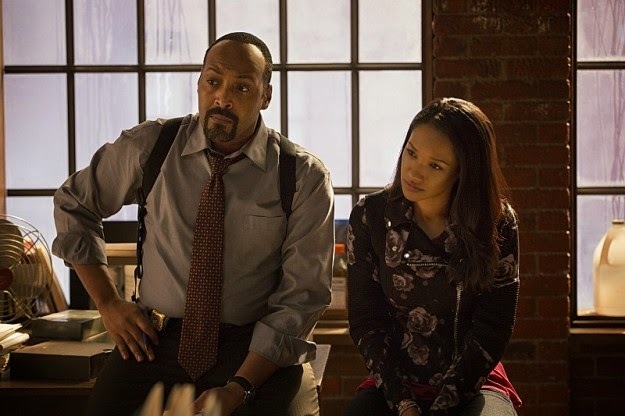 Not only does the whole Star Labs crew know about him, his foster father, Detective Joe West (Jesse L. Martin) does too, and he finds out in the very first episode. True, Barry’s best friend and longtime crush Iris doesn’t know, but she is always pretty much on the verge of finding out. So yeah. Mostly Barry fights crime and is a nerd and saves people with the power of compassion and being really really fast. There’s also a plotline about Barry’s mother, who was killed when he was a kid. 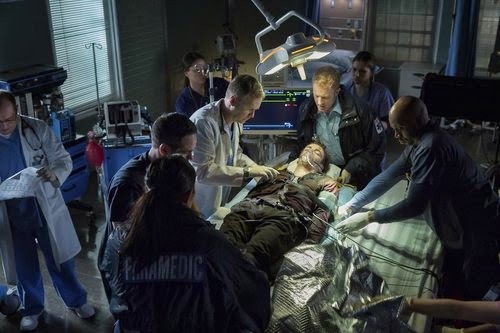 The cops (including Detective West) arrested his father for the crime, but Barry and his father both maintain that she was killed by “a man in a streak of light”. Which is a pretty accurate description of the Flash, so probably we’ve got a bad guy with the same powers thing going on here. Also we’ve got the obligatory romantic story going in the background. Barry is hopelessly in love with Iris, who is totally oblivious and (secretly) dating her father’s partner, Eddie (Rick Cosnett). Ah the traditional love triangle. Of course, it’s made a little more complicated by the fact that Iris and Eddie are genuinely super cute together, and Iris and Barry don’t really ping that way, and Barry has amazing chemistry with Caitlin, actually. Kind of hoping the show pulls an Arrow and changes the romantic plotline accordingly. Oh, and there is some weirdness going on with Harrison Wells, the CEO of Star Labs. Great weirdness, I should add. It’s unclear now whether or not he’s a bad guy, but he’s certainly an amoral guy with a mysterious agenda, and that is a fantastic little Easter egg to have in the background of all of his scenes. Also he might have superpowers. I don’t know what’s going on with him, but I love it. This is what all is happening in The Flash, but the real heart of the show is with Barry and his desire to help people. It’s funny, because this is a DC property, but it really feels like one of the Marvel movies. It’s a world where there are people with superpowers but the heroes focus on saving everyone, the little people too, instead of just fighting supervillains. It’s a show about the little guys. And that’s what makes it so darn watchable and so much fun to tune in to every week. Plus the writing is top notch, really doing a great job of blending the necessary drama with some wry and slapstick humor that keeps it all humming. The cast is pleasantly diverse, though white dudes still abound, and the world of the show is neither so dark it’s kind of confusing why anyone still lives in this city, nor so complex and unknowable that it’s hard to follow the plot. Central City feels like a real place with real problems, that just happens to have a surprisingly large metahuman population. No big deal. As for how this show will tie in with the other DC properties, from TV to movies to comics, remains to be seen. The show already has a strong link to the other CW show Arrow, and will be crossing over (officially) next week. But they’ve already crossed over in the pilot, and last year when there was an episode of Arrow that served as a backdoor pilot for The Flash. So clearly that relationship is solid. 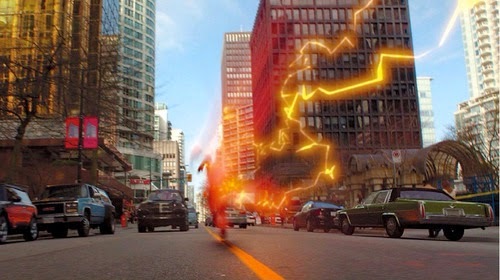 It doesn’t seem overly likely that The Flash will cross over with Gotham any time soon. Not only are they on completely different networks with completely different tones, they also happen in very different time frames. Gotham is a prequel, so it’s not likely to crossover with The Flash, that happens in the present day, give or take. Of course, the powers that be have yet to confirm or deny whether or not the upcoming Justice League movies will exist in the same universe as these television shows. I kind of doubt it, to be honest, but there’s always time to change my mind. See, I don’t think they’ll crossover with the movies because The Flash is so completely tonally different from the “no jokes” ethos of the official Warner Brothers DC movies. I just don’t see it happening. But maybe that’s for the best. After all, comics have been maintaining separate universes and storylines for the same characters and worlds for like half a century now, and that’s worked out pretty well for the fans. I won’t complain if they do decide to make it all one universe like Marvel has, but I’m not holding my breath. The real upshot here is pretty much just if you like superhero movies, and fun, and warm fuzzy feelings, then you should watch The Flash. Yes, it might burn and crash in a season or two. But for now, it’s one of the funnest shows on television, and well worth your time. And also I can't help but revel in the inevitable Forrest Gump reference in the pilot. "Run, Barry, RUN!!" It's really interesting for me to have to remind myself, "Oh right. Gotham and Flash are both DC properties. Huh." Because they are so tonally different. And they seem to have very different aims. But yeah, the best part of Flash is the motive: "Let's save people because everyone deserves a chance!" Love it. The guy who killed Barry's mother is most likely Eddie thawn since in the comics the guy who killed her is Eobard thawne the reverse flash from the future. Yeah, I'm really curious how they're going to fit him into the mythology. They first need to show that Barry can run fast enough to time travel and then they can reveal that Eddie is Eoabard or that Eddie and Eobard are related. Ezra Miller has been cast in The Flash movie already, so unless DC tries to do an Infinite Crisis-typxe event that combines the movie-verse with the Flarrow-verse, Flarrow will remain (thakfully) separate from the movies.